Successful organisations continually Satisfy Customers, Increase Customer Base, Prevent Brand Switching, Address and Solve Problems and Delight their customers. Leaders of these successful organisations are proficient at developing and implementing targeted and customer-centric strategies. These leaders understand their company’s vision, mission and values. They are aware of internal and external conditions and possess skills to utilize these conditions to continually enhance customer experience and satisfaction. This program is designed to instil a Customer Service Mindset and Culture in order to empower the company’s Service Delivery Efforts. Together, we develop effective customer service strategies individually as departments for the ultimate goal of supporting the organisation’s service vision to achieve Customer Delight. 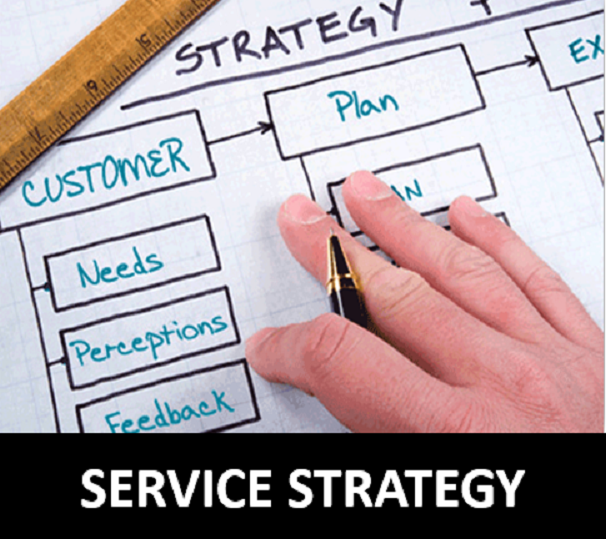 Hence, productivity and profits are realized through Strategic Service Delivery Management. This programme employs adult learning techniques which include fun active learning strategies to facilitate understanding and retention. Participants will spend 80% of the time in individual or group activities which allow them to learn, develop and practice. A workbook is used to facilitate the programme. Structured Experiential Learning Exercises, Super Learning Environment, Role Plays, Games & Simulation & Performance Coaching, Team Presentations. Exercise: Are we proving those dimensions? Exercise: What needs to be done? Shahrukh Moghal is a Certified Trainer by PSMB Pembangunan Sumber Manusia Berhad - Certificate # EMP / 1654. He has over 15 years of experience in call centre training and training coordination. 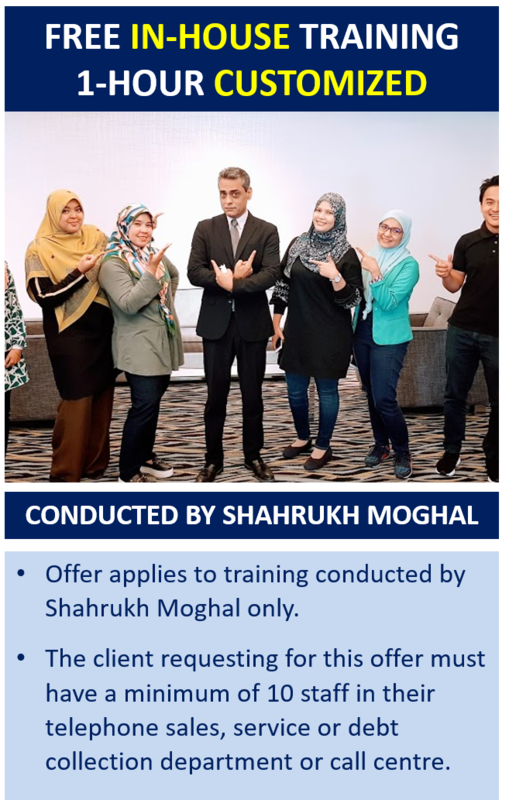 He conducts Certified Contact Centre Professional program subsidised by HRDF under its Graduates ENhancEment pRogrAmme for Employability (GENERATE) scheme for fresh graduates. The experiences that he has injected into his customer contact training and consultancy date back to 1990 when he began his career as a sales and service agent in the United States. Subsequently, he moved up the ranks of agent to team leader to internal trainer over a period of 6 years. Since then, he has been actively involved with developing agent and team leader skills within sales and service teams in a multitude of industries including Media, Banking, Insurance, Telecommunications, Manufacturing, BPO companies, Pharmaceutical Sales Companies, Software Developers and more. This experience as a Call Centre and face to face service and sales trainer and project coordinator has been instrumental in the development of his understanding of front-line staff and team leader psychology, what drives each position and how skills are developed in each area. Mr. Shahrukh is simply an amazing trainer. Dynamic, Energetic, Fun filled and knowledgable of his subject matter in Customer Service training. I won't forget this training!! January 2016. I am amazed at how Mr. Shahrukh uses his presentation to lure participants’ attention. Thus we feel more interested in learning and improving both current and new knowledge in dealing with public. July 2016. Meaningful and lively. My pleasure to observe and glad my team attended. Our Life Insurance sales increased according to statistics after one month of training. I will contact you again for our new intake. January 2015. Good instructor. Understood what he delivered and good communication skills. The way he gave talk is so interesting. It makes me feel excited to know more about it. Everything that he said and gave an example of was relevant to my objective. His overall comedic style of training delivery is interesting and unique. I definitely want to learn more from him. July 2016. Mr. Shahrukh is an experienced instructor due to his past career. Hence, making him the most suitable person to present this subject matter. July 2016. Honda's training relationship with Mr. Shahrukh began almost 8 years ago and is still on going. He has trained our call centre, our Dealership owners and managers on Customer Service Mindset. We will not hesitate to invite him again when the need arises for his expertise in the coming months. This is just what my team needed. These are corporate sales pros and getting them to stay in one room for 2 days is a feat. Shahrukh’s has a certain dynamism about him that keeps us interested through out the training. I enjoyed the pipeline module the most. It helps prioritize my client list. February 2005. Shahrukh trained my Telemarketing team in Maybank a few years ago. I was impressed with the results (increased sales of credit cards and insurance policies). I moved to Sunlife Insurance as Head of Customer Service Call Centre. Naturally I invited him to train my insurance call centre. Service has improved and staff feels motivated. March 2015. Shahrukh is a down-to-earth and very lively trainer who has a natural ability to connect with the participants – he makes learning fun! For the 4 programs he conducted for us, he received an overall rating of 4.76 (out of 5) which is a City-Link record for any trainer before Shahrukh. Shahrukh’s passion for the subject matter is a plus, because he constantly refined his program to improve participants’ learning experiences. We appreciate Shahrukh’s commitment in tailoring his program to meet our organisational needs and environment. Serious improvement is our overall call centre performance index. THANKS SHAHRUKH MOGHAL!! June 2014. Lively, interesting and professional. Got full attention of the participants throughout the 2 days of training. Smooth flow of the training and relevant to my job and also can apply to my personal life. July 2016. The individuals who provided these testimonials were employed in their respective organisation at the time of Shahrukh Moghal's training. There is no guarantee that they will all be still working in the same organisations. I was trained by Mr. Shahrukh in 2007 as a call centre customer service agent for Honda Malaysia. His training modules stayed with me. I invited Shahrukh to train my contact centre team in Mitsubishi also and definitely am glad that I did. I am very impressed with this young man’s training. He makes sure my people grasp what he teaches. Loaded with activities and simulations. No time to get bored. Very good trainer. Shahrukh has trained over 200 of our outbound telesales executives. He taught various teams consisiting of Maybank’s Insurance products telesales and Maybank Petronas American Express Card telesales. After his training, my team demonstrated positivity, motivation, higher level of skills, fearless objection handling and closing skills. Our sales showed a marked increase in subsequent monthly sales reports. November 2010. As Head of Customer Service Training, I have seen many call centre training programs. However, Shahrukh offers a unique and dynamic experience in his 2 days. The participants stayed interested in each of his modules and I am confident that they will take back a whole lot of techniques that will help increase our call centre productivity and revenue. November 2014. Shahrukh has demonstrated his experience in the subject matter during the training for our staff. He ensures that the participants understand and are able to apply the new learning. Our staff has improved on their communication skills, telephone etiquette, understanding customer behaviours, identifying real customer needs to recommend suitable products and services. Very good program and great trainer personality. June 2014.